Basketball World SHOOT IT BETTER Mini Camps are conducted worldwide for players ranging from NBA to youth level. 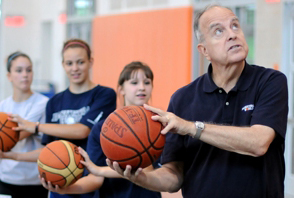 The Mini Camps are for players who are serious about improving their shooting and for coaches who want to learn the latest techniques for teaching shooting. Mini Camps are conducted year round at your site or ours. Mini Camps for adults are also offered. 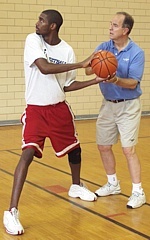 Hal Wissel, Scott Wissel and Paul Wissel have conducted SHOOT IT BETTER Mini Camps all over the world for various NBA players, college teams, high school teams and youth organizations. Contact Basketball World to have a Mini Camp conducted at your site or to participate in a Mini Camp nearest you. Coaches or Parents ... host a SHOOT IT BETTER Mini Camp at your site! As a host, you can use a SHOOT IT BETTER Mini Camp as a fund raiser for your team. 1. SHOOT IT BETTER Mini Camp (2 days, 6 hours). Limited to 36 participants (30 minimum) for personalized instruction. Tuition is $145 per camper. 2. SHOOT IT BETTER Mini Camp (1 day, 4 hours). Limited to 24 participants (15 minimum) for personalized instruction. Tuition is $125 per camper. Improve shooting ... and much more! 1. Learn the breakthrough mental training techniques of positive self-talk, relaxation, visualization, concentration and goal setting that enhance confidence. 2. Develop a better understanding of your shot - the "feel" and reaction of the ball on the rim. 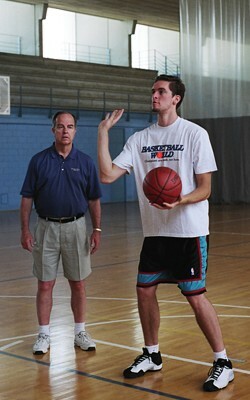 Receive slight adjustments in individual shooting mechanics and key words that improve rhythm and range. 3. Become your own best teacher. Use personalized drills to practice correctly and gain the shooter's "feel." If you lose it, know exactly what to do to get it back. 4. Learn how to transfer the mental techniques for shooting to other parts of your game and to team and personal goals. "Hal, Scott, and Paul ignite the spirit for improvement. They have the ability to crystallize situations, and then select the correct teaching technique in order to achieve maximum success." 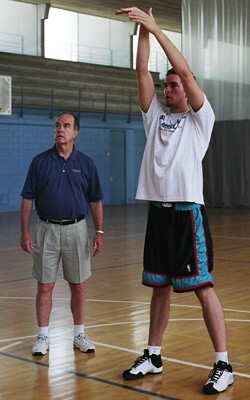 "Each player is given a better understanding of his own shooting technique. When necessary, individual adjustments are made based upon each player's needs and abilities." 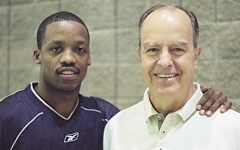 "Hal Wissel helped me understand my own shooting technique. By coordinating my legs and shooting action, I was able to improve my rhythm and three-point range." "Hal Wissel continually works to build your confidence. More importantly he shows you ways to build your own confidence. 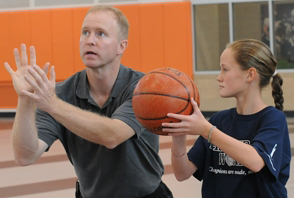 Coach Wissel helped me understand my own shot and become my own best coach." Call toll free 888-812-5452 to schedule a SHOOT IT BETTER Mini Camp at your site! RESERVE A SPOT WITH YOUR CREDIT CARD! SHOOT IT BETTER Mini Camp at your site! Camp dates are now being reserved so contact Basketball World today! Coaches and Parents ... call toll free 888-812-5452 or e-mail Basketball World for more information. In your e-mail, please specify whether you are a coach or parent. Include your name, school or organization, and phone number. Players ... share SHOOT IT BETTER Mini Camp information with your coach! To add yourself to our mailing list, e-mail Basketball World. In your e-mail, include your name, age, and city/state. Also include the name of your school and coach. "THE MAN WHO HELPS THE GRIZZLIES TAKE THEIR BEST SHOT"
For additional basketball shooting articles, videos and progress charts, visit our BASKETBALL SHOOTING page.